Parent-toddler programs are a wonderful opportunity for parents and caregivers to find support in their journey, and for children to play and socialize. Through a morning of play, crafts, circle games and songs, cooking and puppet shows, early childhood experts impart their understanding of child development and offer sources of inspiration for life at home. Special attention is also given to supporting the unfolding of each child’s interests, motor skills, social interaction and problem solving skills. Shedding more light on these programs is Nikita Khanna-Center Head Gymboree Hyderabad which conduct these popular parent-toddler sessions in the city. 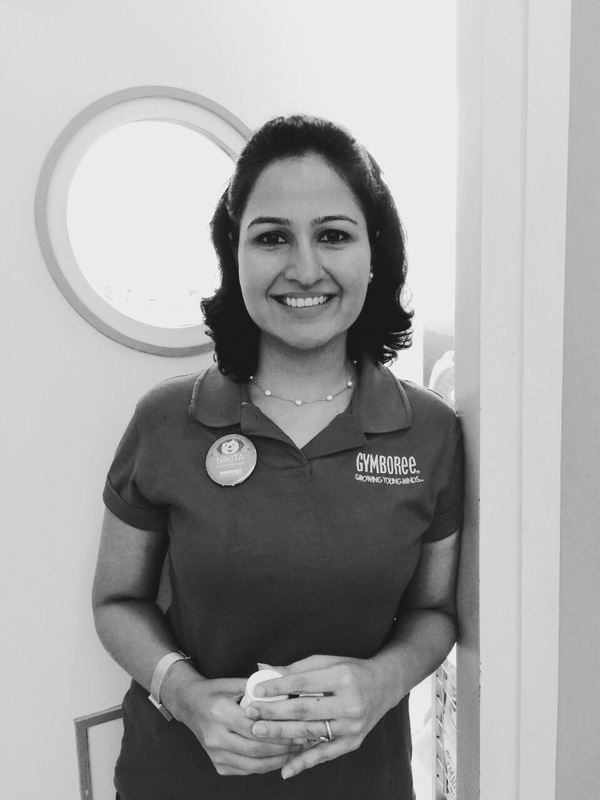 Nikita has been associated with Gymboree for 7 happy years and currently heads the Hyderabad Center. She also does training programs for primary school teachers. A yoga enthusiast for over a decade and works actively with Isha Foundation. Q1. What exactly is a ‘mother-toddler program (parent-toddler)? Nikita: The best play-mate for a child is the parent. In a mother-toddler program, using this beautiful and already trusted relationship, the child’s inbuilt skills are enhanced more while the child plays, sings & does art projects with the parent. In these classes the parent & child plays and learn about each other together, as a teacher guides them through a series of fun things! Q2. Is the entire experience just recreational or are there any learning opportunities involved? Nikita:Things that don’t exist are recreational in nature, like cartoon characters. Early experiences for a child are the prime opportunities of growth for them. The more these get stimulated, the more the child learns. Child learns only through PLAYING & GAMES. Hence these are not recreational, but a possibility of growth for the child. Q3. Parents who are active in their child’s education are demonstrating that education is an important family value. How important is parental involvement in the growth of children of this age group? Nikita: Education will minimize the vices in the society and yes lots of emphasis is laid on educating every child, and I am happy for this. As we all know, that children are most naturally receptive to learning in the 1st three years of life, their brain grows to 80% of its adult size by then. When I say learning, I don’t mean education, I mean skills. Skills like social, emotional, cognitive and physical. The experiences the child has during these early years shape and refine their adult personality. So it is critical that parents are involved with the child’s learning during these years as it is the parent who is one of the most trusted person for the child. Q4. It is said that the child in the infant to toddler age range is capable of amazing learning. What types of social skills or sensory skills does such a program help to establish? Nikita: Children can grasp way more than what adults can. All their senses are very heightened in the initial years, they can even smell things that adults can’t! Many skills can get nurtured during these years on physical level- many gross and fine motor skills, social level – interaction with others, emotional level – how to deal with their own emotions and others emotions, cognitive level- how to problem solve, communicate, think creatively etc. Q5. What types of physical activities are encouraged in these programs? Nikita: Many muscles are inactive in children because of they lack stimulation. While kids climb, jump or roll down from a height on play equipment, these muscles gradually become strong and can be used in their adult life. Fine motor muscles, like pincer grasp, using their fingers are also encouraged during art classes. Such programs also stimulate their social-emotional & cognitive development too. Q6. What tips would you give a parent so that the whole experience for both the parent and child is pleasant and fun? Nikita: Be encouraging and patient with your child. Above all, have FUN with your child, drag down the “adult” role and play with them! Make the child feel like you’re their partner in play, not to discourage them in trying new things but to encourage them to explore. Q7. Does such a program help prepare a child for their entry to a preschool? Nikita: Lets 1st understand the role of a pre-school. Its supposed to prepare you for a school. And the role of a school, is to prepare you for college. And a college is supposed to prepare you for a job, which will make you earn a living, so that you are happy in your life. So, in short, we spend years in school, college to become happy in our future. In a mother-toddler class, is the child happy? Of course they are! Coming to admissions, all the leading schools happily welcome children who have participated in mother-toddler activities are these kids demonstrate better social-emotional stability, which is an important skill for any future learning. Previous KidEngage DIY Hacks -Floral collage for Mum & Dad!